Walmart made a few changes to their policies this week that we need to take a look at. First of all, all of their most important policies are now on one page and can be found here. Next, the Walmart coupon policy appears to by untouched since the last time they changed it. It’s the Walmart price match policy that has been overhauled this time. The biggest change is that there is no longer separate policies for ad matching an offline competitor’s ad and price matching an online price, it’s all rolled in together. In fact, it’s mostly just the old online price matching policy with a few lines about matching offline prices also. Walmart will Price Match local competitors and select online retailers* for an identical, in-stock item. That’s pretty much the extent of the guidelines the new policy gives us. If it’s an exact match and in stock, Walmart will match the price. The end. One other thing to note is there is a limitation that used to only apply to online matching but now that the policies are combined, Walmart “reserve[s] the right to limit quantities to one-per-customer, per item, per day” I can’t imagine they will ever enforce this on offline ad matching, but it’s there if they need it. Another change to note is “Walmart.com will not Price Match from Thanksgiving Day through the Monday after Thanksgiving”. This doesn’t affect anything at the store level, just if you are trying to match something at Walmart.com. So that’s the new policy we are working under. Hopefully this will only serve to make price matching at the register an easier experience for us all. 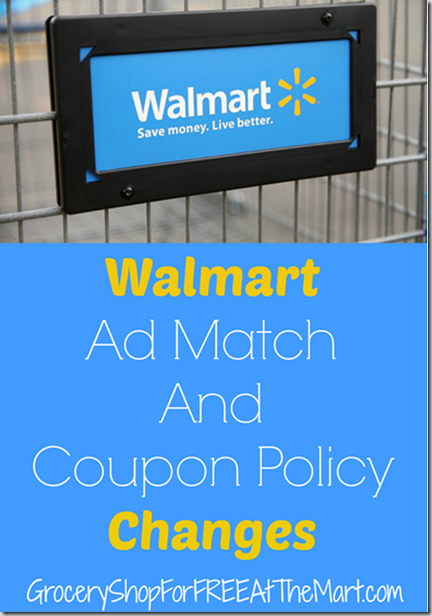 Walmart Tweaks Their Ad Match Policy Again! Walmart has added a few lines to the Walmart Ad Match Policy. Here is the new section. We do not require customers to have the ad with them to honor a competitor’s ad; but we do require the store to verify the ad if there is a difference in price greater than 25% from the competitor. The system will prompt for supervisor verification at a 50% reduction in price or greater. The big change here is that if you ask for an ad match that drops the price more than 25%, the associate will have to check the price and not just take your word for it. If you ask for a greater than 50%, a supervisor will have to ok the transaction for you to complete it. Hopefully this will stop associates from asking to see the ad when you are asking for a $.20 reduction in a can of pork and beans. 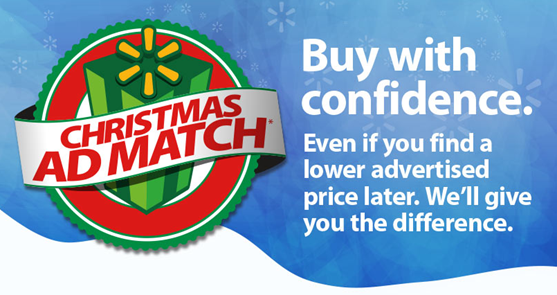 Walmart Has Updated Their Christmas Ad Match Policy! Walmart has updated their Christmas and Black Friday Price Matching policies! Walmart will price match any local store ad from now until Christmas Eve INCLUDING Black Friday ads (These were previously excluded) Just remember it has to be for exactly the same item. You cannot buy items ahead of time then come into Walmart on Black Friday and try to price match to get the difference back. You can, however, buy something at Walmart and if you see it advertised for cheaper in a non-Black Friday ad somewhere, Walmart will give you the difference back in a Walmart giftcard. If you do this, remember that you just need to bring in the receipt, not the item itself. This policy now extends to online sales. 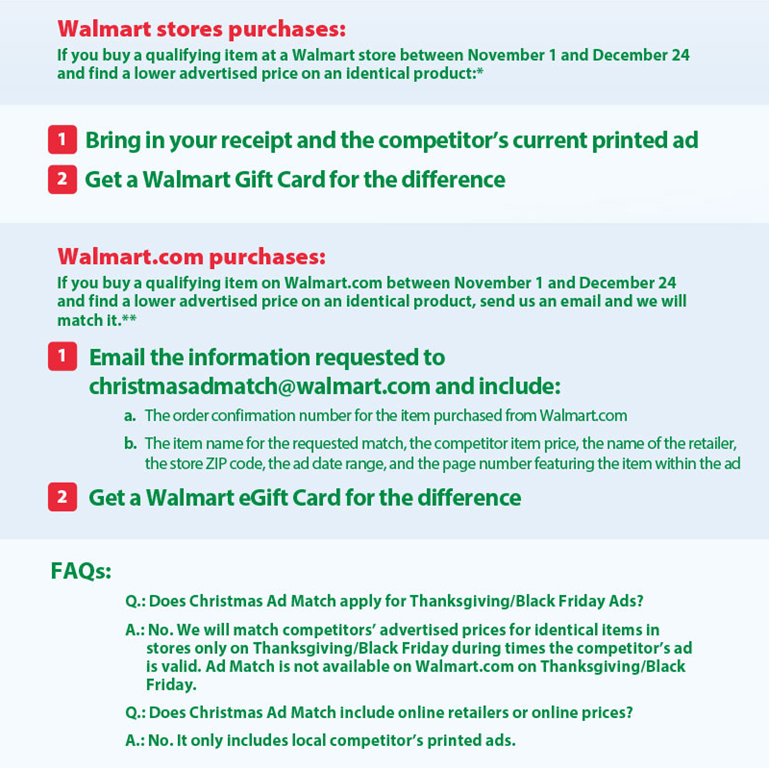 If you buy something from Walmart.com and see it cheaper in a local brick and mortar stores printed ad, just email [email protected] your order confirmation number and the other details listed below to receive a Walmart eGiftcard for the difference. Walmart will still not price match online retailer prices. Walmart will also be adjusting their regular prices to match most national chains advertised prices so less price matching will be needed. Any questions? Leave them in the comments and I will get you the answers! Don’t forget to look at the 2013 Walmart Black Friday Ad! Walmart Policy Update: Great News for our Neighbors to the North! Good news for all you Canadian Walmart shoppers! 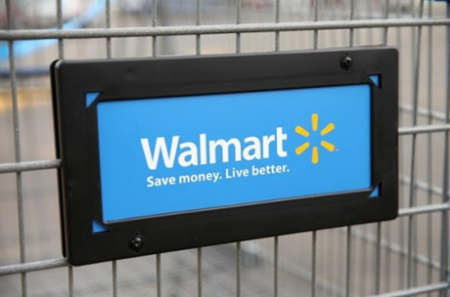 Walmarts in Canada will now price match ANY store in Canada! (Not just the local stores) This a HUGE deal for those of shopping in Canada. This excludes wholesale and warehouse prices. DOUBLE UPDATE: I can confirm (Thanks to some helpful readers) that they are indeed price-matching at t he Walmart price so the Cheez-Its example in the previous (lower) update is exactly correct. However, there is a limit of 2 deals (4 items) total. UPDATE: According to a new story from All You it looks like Walmart is price matching BOGO deals from Florida area stores like Winn-Dixie and Publix at the normal Walmart price. So in the example below, you would get both boxes of Cheez-its for $2.50 PLUS you can use coupons on BOTH items. This is getting to be an even bigger deal than I originally thought. Please note that this change ONLY affects Florida shoppers. The Tampa Bay Times posted a story today about a change in Walmart’s price matching policies. The only problem is that it’s unclear what exactly the change is. Here’s the problem, the story is unclear about what exactly is being price matched. In the scenario above, it seems as if you can get 2 boxes of Cheez-it for $2.50. If that is what happening, that is a HUGE deal. Beyond Huge. Put Publix out of business huge. However, I feel like someone may have been misquoted and they will continue to PM Publix getting you those 2 boxes of Cheez-its for $3.69. But, to be clear, I could be wrong. I’ve written the Walmart PR department for clarification so I’ll let you know as soon as I hear something. In the meantime, have any of you done this yet? I’d love for someone in the Publix area to try this out and tell me what happens. 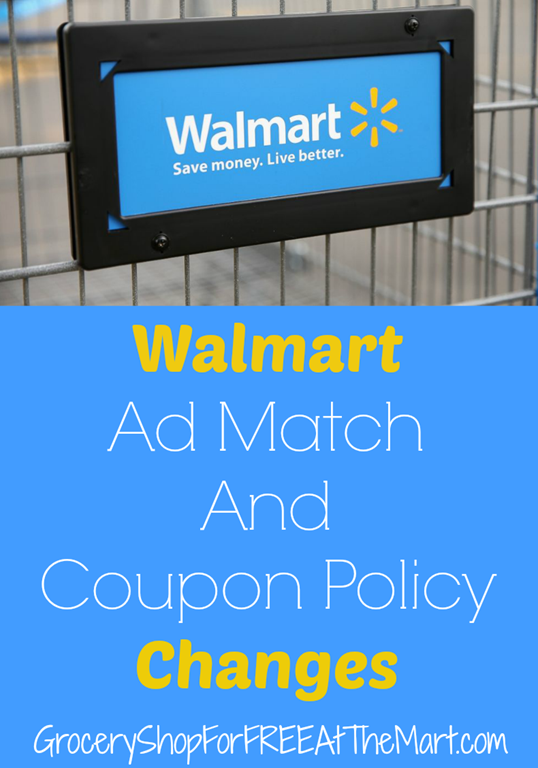 Has your Walmart changed their Ad Match policy? The upshot is this: if you are price matching more than one item, you must have the ad even though the national policy posted online here says that you do not need the ad ever. I was curious if this was a new national policy or if it was just my store so I contacted customer service, here’s the salient portion of our conversation. Aarn Farmer: Here’s my question. My Walmart has a new policy posted stating that if you are PMing more than one item you must have the ads. Your online policy says you don’t need the ads ever. Which is correct? Katonya: Aarn, the process varies from store to store. Katonya: I completely understand how you feel, because my local Walmart store states the same thing of the ad needs to be provided to price match. Aarn Farmer: OK, so there isn’t a set policy nationwide? Aarn Farmer: ok. Thanks a ton. One more thing. Would you know the approximate percentage of stores ignoring the online policy? Katonya: Aarn, unfortunately, we do not have a database confirming which stores that varies regarding their price matching policies. Katonya: And you are very welcome. Kind of makes you wonder if anyone even remembers this commercial. #1 The first thing you need to know is the reasoning here. The reason they initially didn’t want you to show the ad is for time’s sake. Walmarts are very busy and scouring ads for every order would be a killer on their already-to-long “customer standing in line” time. However if you are PMing several things, the store just wants to make sure it’s not being taken advantage of. #2 I’ve been saying for years to always take your ads with you so hopefully this won’t cause any changes to your shopping routine. Remember to sign up for your favorite store’s mailing list to get your ads, check your newspaper, and have them bookmarked on your smart phones to be able to access them quickly. #3 Most importantly, know your store’s policy. Make sure you know what they will be looking for. 3 Things You Need to Do to Survive Walmart’s Coupon Policy! Walmart has made a few changes to their coupon policy recently. The differences are very small but the upshot is this: if a coupon doesn’t scan. they won’t take it. No more manager overrides or an associate keying in the amount, it has to be scanned. Also, they have to be scanned with the flat scanner, not the hand-held ones. What’s going on here is Walmart has made the switch to the new double barcode system that is on all coupons, hopefully this means less fraud and the stores can stop panicking about coupons and leave legitimate couponers alone. Hopefully. 1. Print well. Only coupons printed clearly are going to scan so make sure your printer has ink. It doesn’t necessarily need to be color but your black needs to be full. 2. Clip well. Sometimes when clipping 10 coupons or more out of the paper at the same time will cause you to clip a little of the barcodes off. Don’t do that, be sure your papers are perfectly lined up before you cut. If you run into an issue with the new policy, (like a particular coupon isn’t scanning) let me know so I can let others know to be careful with that coupon. Thanks in advance!